SUNDAY ACTIVITIES will continue as planned! Taste and learn about the wines of Barbaresco, the Queen of Italian Red wine. Listen to the stories about the family owned winery Castello di Neive of Piemonte and their Monopole, (Cru) Santo Stefano. We will also sample Arneis, Dolcetto and Barbera. Castello di Neive comprises a 60 hectare estate, all in the Neive township, in the Langhe area of the Piemonte region. 25 hectares of the property are devoted to grape growing. All the production is obtained from Castello di Neive’s own vines in the following vineyards: Basarin, Cortini, Gallina, Marcorino, Messoirano-Montebertotto, Valtorta and the famous Santo Stefano. 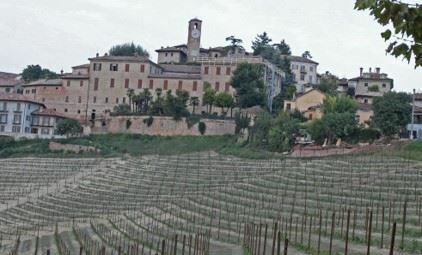 The wine tasting will feature six wines: Arneis, Grignolino, Dolcetto, Barbera, Barbaresco and Barbaresco Santo Stefano. With a passion for food and wine…Nikki’s storied career includes, restaurant management, boutique wine wholesaler, retail management/buyer in Wine & Spirits. Nikki’s full-time position is Italian fine wine specialist & Territory Manager of Minnesota, Iowa, Nebraska & the Dakotas, for Leonardo LoCascio Selections, a member of The Winebow Group. Nikki’s role as wine educator began in 2011 at Saint Paul College teaching the 14 week-Wine Professional Certificate program and now also runs the Globally recognized WSET level 1 and 2 wine courses at her new school, Vine Lab Wine & Spirits Academy MN. Your registration to this event must be cancelled at least 96 hours in advance to receive a refund, less administrative costs.